HAPPY NEW YEAR! It’s 1st of January and an exciting 96th edition of Sampada is here for you! 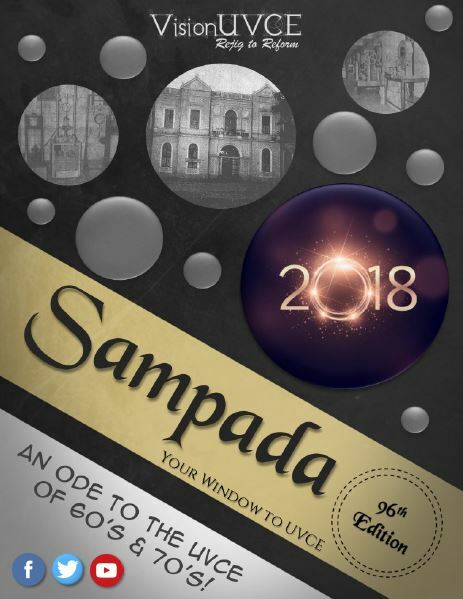 Waving a goodbye to 2017 and making way to an enthusiastic 2018, we thought how about giving our edition of Sampada also a little makeover! As we approach the centenary milestone for Sampada, we wanted to make the editions more and more special for you! 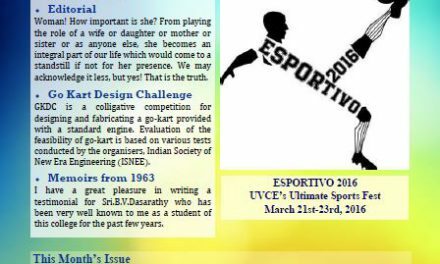 So here you go, this edition of Sampada is titled “An Ode to the UVCE of 60’s and 70’s” with soul agenda of revisiting memories and times of the engineering batches of UVCEians from 60’s and 70’s. When we set out for the edition and dropped a mail to the senior Alumni to be a part of this, the response we received was overwhelming! Therefore we wish to dedicate our heartfelt gratitude for their involvement. 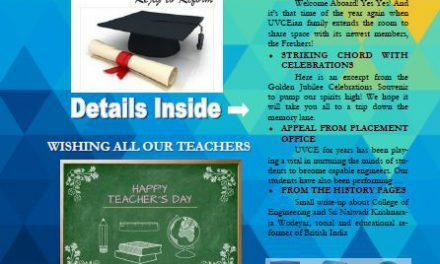 Captured in this Sampada are some fun memories like ‘Ili Bele Bath’, moments close to heart with ‘Remembering UVCE’, an exceptional Guest Editorial, a narrative of UVCE and its glory back then with ‘UVCE-An ocean of memories’ and much more! Couple of interesting announcements from VisionUVCE Team are also awaiting you inside this edition! Hope this edition serves you as a new year treat! The upcoming editions will be more different, astounding and heartfelt – this is our promise!